Based on a simple model for predicting match results, I've simulated the World Cup 10,000 times to evaluate the likelihood of various outcomes and investigate some of the quirks of the tournament. If you're interested in the technical details, scroll down to the Appendix. As the tournament plays out, I'll be rerunning and updating my predictions: follow me on Twitter (@EightyFivePoint) if you're interested. [Update! I have now made the Python code for running these simulations public: you can find it here]. Figure 1 shows the proportion of world cup simulations won by the sixteen most-likely victors. Brazil and Germany are the clear favourites, winning 17% and 16% of simulated tournaments, respectively. So both have roughly a 1 in 6 chance, which is lower than the historical rate at which they have won the World Cup: 4 in 18 attempts for Germany (or West Germany) and 5 in 20 for Brazil. The bookmakers agree, offering odds of 9/2, a probability of 18%, for both teams. Brazil versus Germany is also the most likely final, occurring in 6% of simulations. Figure 1. 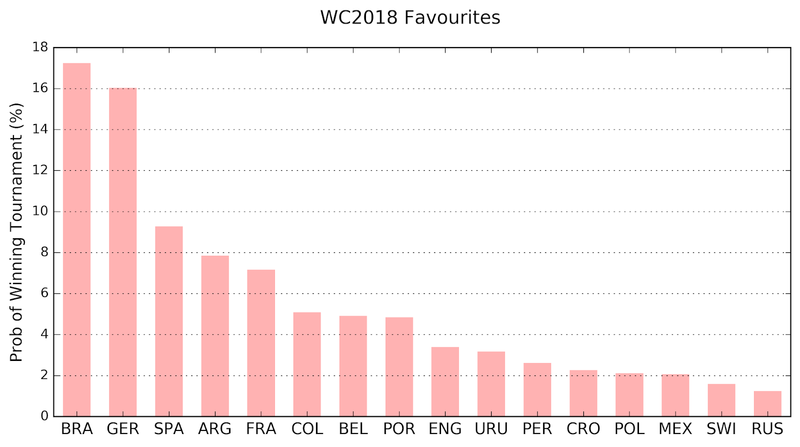 Probability of wining the 2018 World Cup for each of the top 16 favourites, based on 10,000 simulations of the tournament. Despite the fact that, between them, Germany and Brazil have won nearly half of all the previous tournaments, the model predicts there to be a 67% chance that a different country will win, and a 36% chance that we'll have a first-time winner. The chasing pack include Spain (9% chance), Argentina (8%) and France (7%). After that come Belgium, Portugal and Colombia, each with a 5% chance and all three chasing their first world cup victory. England have a 3% chance of ending a half century of hurt. 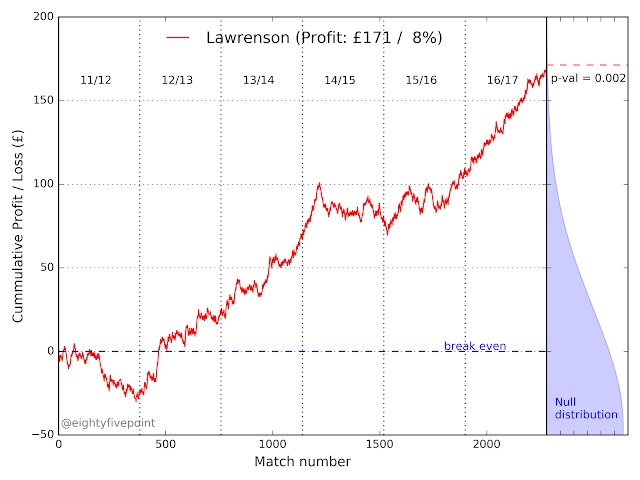 Hosts Russia, meanwhile, win only 1% of the simulated tournaments. Let's rewind back to the start of the tournament and take a more detailed look at the group stage. 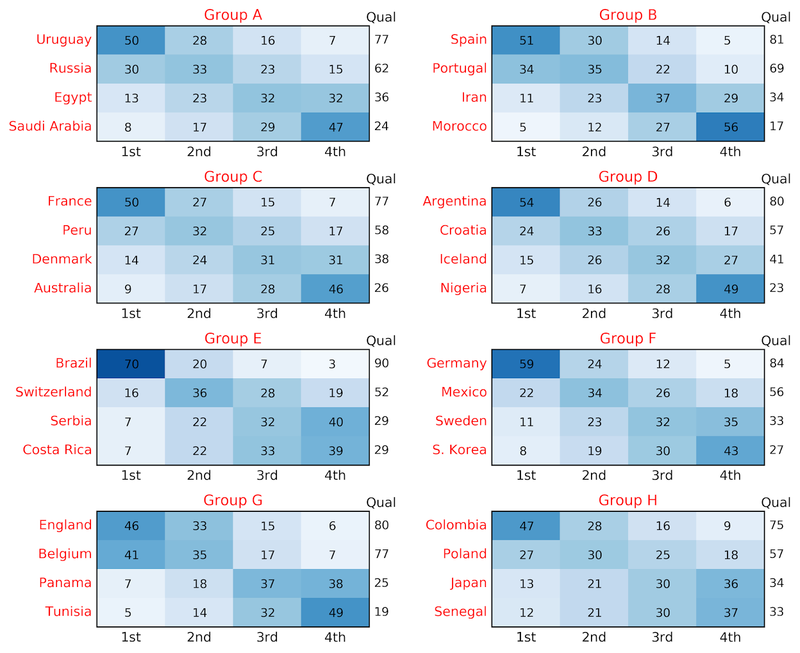 Figure 2 shows the probabilities of each country finishing in a given position in their group, from first to fourth, according to the simulations. The numbers down the right-hand side of each group table (labelled Qual) indicate the probability of the team qualifying for the round of 16, the first knock-out round. Only the top two teams in each group qualify for the round of 16, with the winner playing the runner-up of the neighbouring group (e.g., the winner of Group A will play the runner-up in Group B). Figure 2. 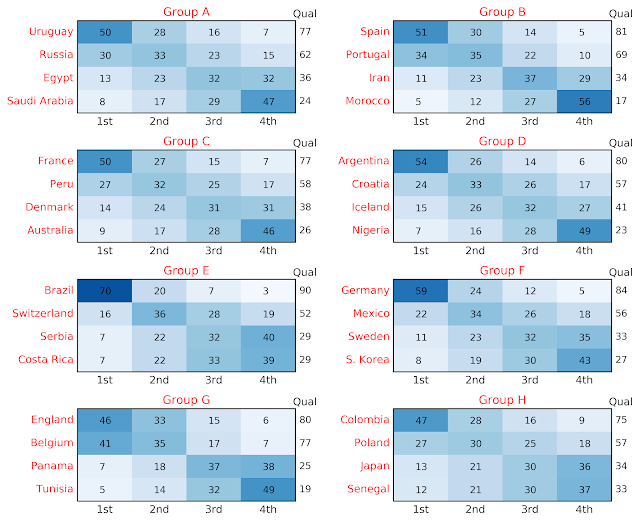 Probability of each country finishing in each position in their group table, from 1st to 4th. The Qual column indicates the probability of the country finishing in either first or second position (and therefore qualifying for the knock-out stage). The winners of each group will play the runner-up of the neighbouring group in the round of 16 (e.g., the winner of Group A plays the runner-up in Group B). Figures may not sum due to rounding. Figure 3 provides a more comprehensive picture of how far the model thinks each country is likely to progress in the tournament. 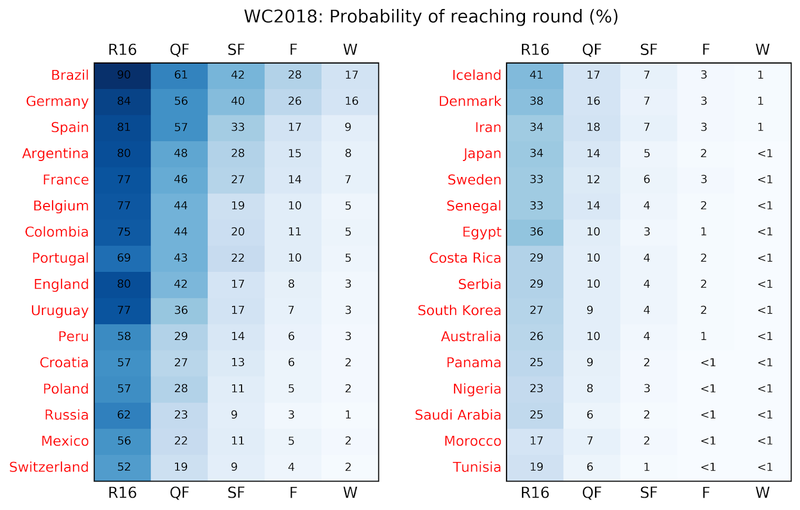 It shows the probability of each country reaching a given round, from the round of 16, the quarter-finals, semi-finals and final, to winning the tournament outright. For example, Germany make it to the round of 16 in 84% of simulated tournaments, the quarter-finals in 56%, the semi-finals in 40%, the finals in 26% and win the tournament outright in 16%. England benefit not only from being drawn in the easiest group, but also a relatively generous potential round of 16 tie against a team from Group H (most likely either Colombia or Poland). This gives them a 42% chance of reaching the quarter-finals, at which point they typically run into Brazil or Germany and get knocked out. Belgium are actually expected to progress further into the tournament than England, despite the England having a higher probability of winning Group H: once we get into the knock-out stages, England's poor historical performance in penalty shootouts makes Belgium the stronger of the two. What is England's most likely route to the final? There are two predictive variables in the model: X1 = ΔElo/100, the difference between that Country's Elo score and their opponents', and X2 is a binary home-advantage indictor equal to one if the team is the host nation (i.e. Russia) and zero otherwise. Note that Elo scores are explicitly designed to be predictive of match outcomes. The initial Elo score for each team is taken from EloRatings, (using the average of the last year, rather than their latest score). The method does not use any information on individual players. Simulations are run 'hot', which means that the Elo scores are updated after each simulated match (using the procedure described here). This has the effect of propagating the impact of a result to future matches, whilst adding a little more variation in the tournaments outcomes by slightly increasing the probability that the weaker teams will progress further into the tournament. If a match ends in a draw in the knock-out rounds, penalty shoot-outs are simulated, shot-by-shot. Each team is assigned a penalty 'strength': the probability that they score each penalty. This is determined based on their performance in previous World Cup penalty shoot-outs combined with a beta-distributed prior around the historical average (73%). Hi Laurie I just want to say excellent post. I can't belive that Colombia (not Columbia ;) ) has that chance of winning the WC. I'm on the process of understand your code. Great piece of information. I'm looking for Fifa World Cup 2018 Updates, any idea?